Mustang door panel removal and replacement. Removing or replacing a Mustang door panel is one of the most common tasks you can have if you own or are restoring a classic pony car. These panels, particularly in cars with a standard interior, can get pretty beat up over time. 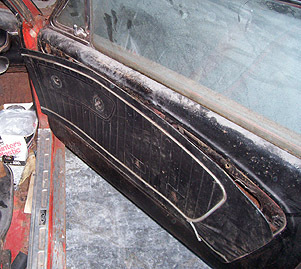 Stay tuned,and we'll cover how to do your own door panel removal and replacement. Part one - covers 1964 1/2 to 1970 vintage pony car door panel replacement. Part two - shows you how to remove and replace panels in 1971,1972 and 1973 cars. Find it here. Part three - Need better speakers? Find out how to get those 1994 to 2004 door panels off and to get those 10,000 watt beauties thumping out sound from your Mp3 player. Find it here. Part Four Yah, its almost new, but all the more reason to add those cool door inserts and a bigger subwoofer in your 2005 and later Mustang or Mustang GT. Here's how.